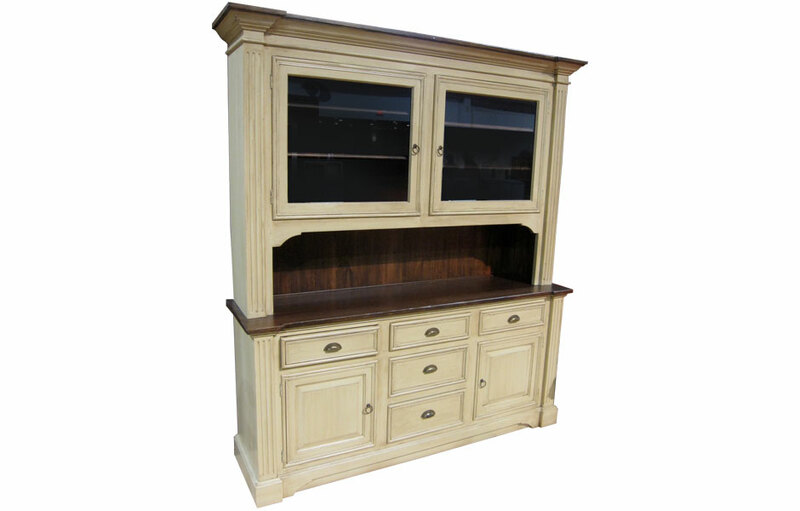 The French Provincial Hutch has a sideboard base and a hutch top. The base cabinet has 5 drawers on full extension glides, and 2 doors behind which are adjustable shelves. The upper hutch has 2 wide glass doors, the openings are separated and each has 2 adjustable shelves. The handles are iron rings and cup pulls. 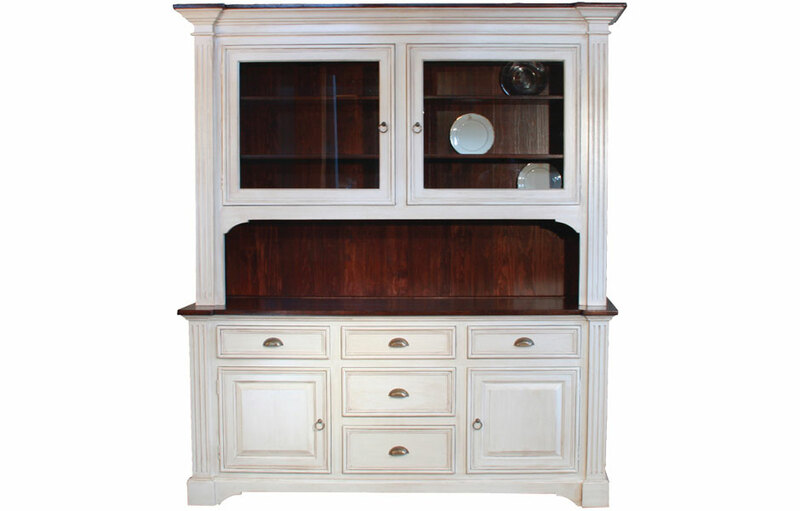 Inspired by 19th-century French design, our French Provincial Hutch is handcrafted of solid wood and delivers today’s functionality with an inspired historical design. 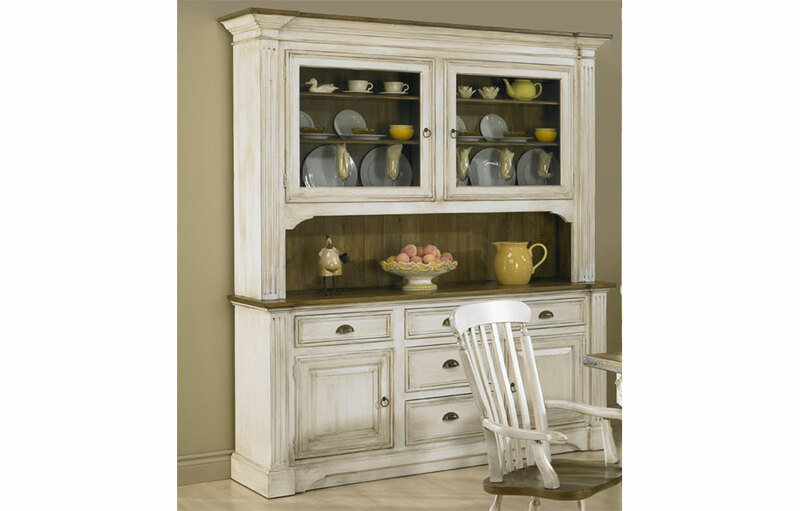 The French Provinicial Hutch has a regal presence in a dining area with its tall, fluted columns, glass doors and generous crown molding. 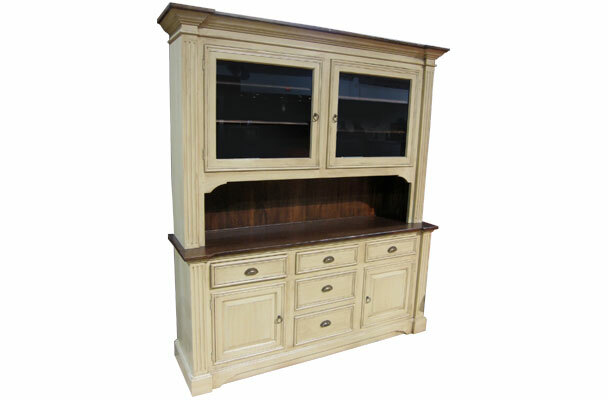 The large china hutch is built in two pieces; setback hutch top and buffet base. The two pieces are fastened together to form one functional dining storage piece. The upper setback hutch features grand fluted columns with offset caps and crown molding. The upper doors are glass framed with thick cut moldings and adorn with hand-forged ring pulls. The upper doors open to (2) storage bays with fully-adjustable height interior shelves. The lower buffet base has a water-sealed top intended for food and drink service. The elegant, fluted columns continue to the floor with offset base moldings. There are three horizontal and vertical wood drawers all on full-extension tracks that glide with ease. The side cabinet doors open to one centered removable shelf for storage flexibility. Each drawer has a traditional French farmhouse metal cup pull. The French Provincial Hutch complements French Country, English Cottage, Farmhouse, Rustic, Transitional and Traditional style decors. 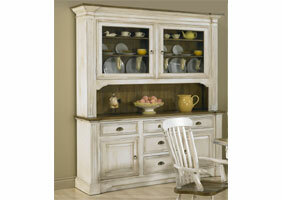 French Provincial Hutch with Buttermilk Glaze. 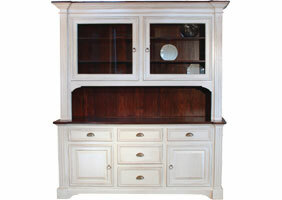 French Provincial Hutch with Sturbridge White. 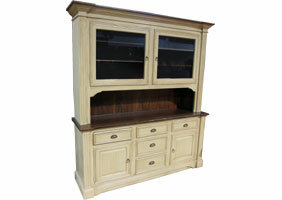 French Provincial Hutch with Sturbridge Glaze.